Are hedgehogs truly grouchy, or are they simply misunderstood? “I’d rather be alone.” One of the biggest misconceptions about the hedgehog is that this naturally shy animal is “grumpy” or “grouchy.” The reality is that hedgehogs simply fear changes in their environment (i.e., being handled by a new person). “I heard that!” Hedgehogs have poor eyesight, but heightened senses of hearing, motion detection, and even emotion detection. This makes them very sensitive to changes in their environment and in your approach and mood. The way you approach and handle your hedgehog can determine its reaction. “Trust takes time.” You must prove yourself trustworthy before a hedgehog can completely relax and enjoy your company. To do this, you must be persistent, patient, and relaxed. If your pet senses you are afraid to handle it, then it will most likely react defensively. “Take a step back, please.” When hedgehogs are nervous or scared, they will ball up, becoming handfuls of prickly quills. This natural defense mechanism is not a sign of aggression. They are simply protecting themselves from the unknown. “I don’t feel so good.” Hedgehogs with health issues may be less responsive to handling due to pain or discomfort and may prefer to be left alone. 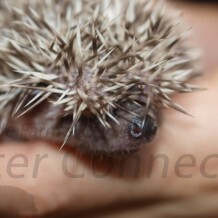 Quilling is an example of a normal process that can be very uncomfortable for a hedgehog and can affect how it prefers to be handled. If your usually calm, sweet pet becomes “grouchy,” take time to investigate the cause and assure yourself that your hedgie is not ill.
“Turn up the heat!” A cold hedgehog is an unhappy hedgehog. Hedgehog owners report that adding heat sources to their pets’ cages often makes them more comfortable and therefore more relaxed and friendly. When to handle a hedgehog. How to pick up and hold a hedgehog. What can cause a hedgehog to be scared or nervous. Proper handling is critical to socializing your hedgehog. Your ability to handle the animal gently and confidently is one of the most important factors in determining whether or not a hedgehog is the right pet for you. As a hedgehog owner, you must learn to understand your pet’s subtle ways of communicating and its behavioral patterns, and how to respond accordingly. Bonding, as with any pet, is an important part of the socialization process. You will most likely find it takes longer to bond with a new hedgehog than with a new puppy. Be patient and persistent in your handling routine. Speaking of patience, this is probably the most important virtue a new hedgehog owner can have to successfully socialize a hedgehog. Our years of experience with hedgehogs has led us to believe that more time spent with an animal does not always result in a more socialized pet or better bonding. Your actions and emotions during the time you handle your pet (quality time) may very well make a larger impact than the amount of time you spend with your pet (quantity time). Certainly, the amount of time spent with an animal is important, but how you handle and react to it during that time and bonding process are far more important. If you continually handle your hedgehog the wrong way, or if you are afraid of the animal, you will make little to no progress in socializing and bonding with your pet. However, by handling your pet the right way and responding to its needs with confidence, you can speed up the bonding and socialization processes dramatically. Many “grouchy” hedgehog behaviors such as clicking, popping, and huffing are learned responses to the way a hedgie is handled. When hedgehogs sense something coming toward them, they will naturally huff and puff to protect themselves. Hedgehogs quickly learn that they should huff and puff when a hand approaches, because they are going to be picked up. You should find this reaction becomes less frequent as you bond with your pet. But, if you are handling your pet incorrectly, it may continue to react this way. Your hedgehog will become more nervous about the process of being picked up if you are nervous. Making repeated failed attempts to pick your hedgie up, due to your fear, increases its anxiety when you approach. Imagine a nurse preparing to give you a shot. Instead of giving you the shot confidently, the nurse has to aim at you six times before she makes the plunge. Please refer to the article about Huffing, Puffing, and Popping. Some animals are just born grouches. However, the way young hedgehogs are handled—and the persistence and patience of the handler—can greatly alter their adult personalities. Just like a human, a hedgehog may become grouchy because something is making it uncomfortable: it may be in pain or simply nervous. More often than not, a “grouchy” hedgehog can be coaxed out of its grouchiness with proper handling, a lot of patience, and time. Unfortunately, some hedgehogs, like other pets, are abused both intentionally and unintentionally. Intentional abuse includes neglect and deliberately cruel behaviors. Unintentional abuse occurs when individuals simply do not understand proper hedgie care and handling. Pet owners have said their hedgehogs like to be “bounced on the bed” or “rolled on the floor” like a ball. (They don’t!) Some people, often children, are simply ignorant of how their actions truly affect their pets. Hedgehogs do not cope well with abuse. An abused hedgehog may never enjoy being handled by humans. This is important to remember when adopting an older hedgehog. Try to find out as much as you can about the care and conditions to which your new pet was exposed before bringing it home so you will be prepared. Some hedgehogs simply do not like human interaction. No matter how much time is spent trying to socialize them, they will refuse to bond with their owners. It is rare, but hedgehogs have been known to try to bite in retaliation to being handled, properly or improperly. If a hedgehog does bite you, try to remain calm and secure the safety of the animal before tending to yourself. Most bites are quick nips and don’t even break the skin. However, some hedgehogs have been known to latch on. If this happens, do not pull away. Set the animal down on a secure, solid surface and wait for it to let go. In the case of a true grouch, we believe it is helpful to find an experienced hedgehog owner and/or rescuer who can assist in attempting to turn the hedgehog’s personality around. Unfortunately, sometimes the personality of the owner and the hedgehog simply do not match. For some hedgehogs no matter how much time and attention they are given from the time they are a week old, they will still be unsocial. It’s like people. Some are simply born shy. Some hedgehogs’ personalities change during the process of quilling. You could consider this your pet’s adolescent angst period. Littermates, like human siblings, will have different personalities. To say that all hedgehogs will become socialized with proper handling and time is deceiving. Most will, but there will be the occasional exception. When you are having problems, the most important thing you can do is to stay in touch with your breeder. Most breeders will ask you to send a video of you handling your hedgie or have you return with your pet to his or her home or place of business. Many hedgehog owners have had success using lavender essential oil for their grouchy, stressed hedgehogs. Apply one or two drops topically, or use in a diffuser in the room. Nancy. (2009, May 31). Behavior Expectations. Hedgehog Central Forum. Retrieved February 4, 2012, from http://hedgehogcentral.com/forums.